Hello loves! I’m so excited to be heading to Las Vegas for spring break! Even though I know I’m going to get some sun on the trip, I love having a bit of a tan before I even leave town. To achieve my pre-spring break glow, I’ve been using the Jergens Natural Glow Wet Skin Moisturizer Medium to Tan. This product is easy and hassle-free to use, gradually adds a natural looking color to the skin, and can be found in the lotion aisle at your local Walmart or online. This product is a gradual self tanner which means that when used daily, a natural tan color will develop in about a week. What makes this product different from other gradual self tanners is that it is designed to be applied on wet skin. I kept my Jergens Natural Glow in my shower and applied it after I turned off the water but before I dried myself off. For best results, it’s recommended to exfoliate at least once a week to prevent the color from sticking to dead skin. Below is a before picture for reference. When I apply this product, I use a dime size amount on each arm, and a quarter size amount on each leg. Another reason why I love this product is that it is white when it comes out of the bottle; it does not have a tan color to it that would cause any messes. The Jergen’s Natural Glow absorbs into the skin quickly, and there is no need for you to worry about it transferring onto your towel when drying off after your shower. You can truly Create Your Own Sunshine with this product! 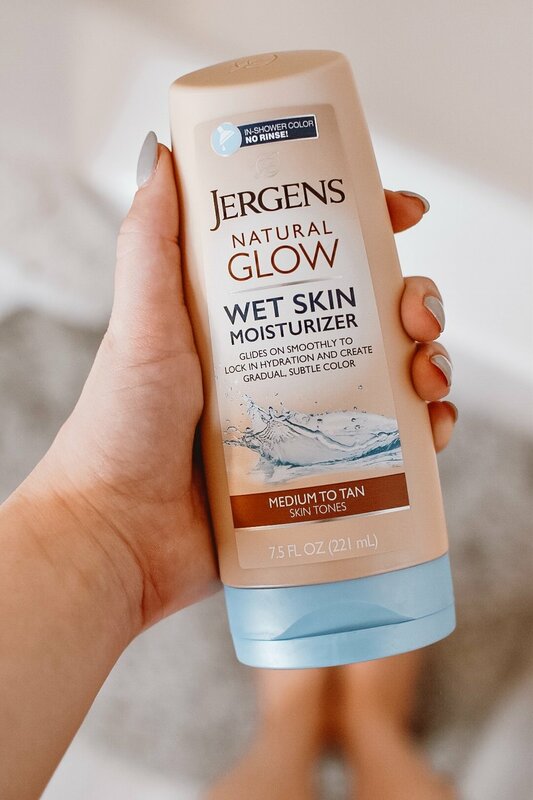 One of the best qualities about the Jergen’s Natural Glow is that it does not have that foul self tanner scent as some other products that I have tried out in the past. Besides how great the results are, this is my favorite thing about this product. I hope this post gave you insight on how to easily achieve a pre-vacation glow at a low price! Be sure to check out the Jergen’s Natural Glow Wet Skin Moisturizer Medium to Tan on your next trip to Walmart.